When artistry of people Ebeg or this Kuda lumping dance created or started is exist? there is not even one man knows. It is said something calls one of way of from Wali Songo (nine people sponsor) religion mission spreaders Islam on Java public to through artistry where this media applied to depict struggle story of Raden Patah assisted by Sunan Kalijaga in rides on horseback to enter hinterland. Or also used at empires era in Java in team practice strategy prince warrior Diponegoro to draw up member of public if at any times is required to become soldier to train, before they apply horse actually. Visible this from clothes used by dancer as well as movement of dance looking like empire soldier riding on horseback with maneuvers to march, rotary with next player commando, dashes against like will battle. 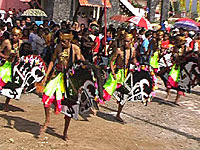 Ahead show of dance Ebeg or Kuda lumping dance, showed in event of like child of circumcision or marriage. But along with development of era with the entry of modern entertainment amusement types of Group Band, Dangdut music, Film, Single organ etc, causes staging of this folk dance not as hilarious as formerly but immanent up this moment until now. 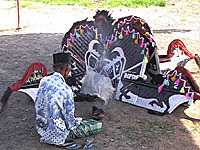 In a group usually is consisted of 6 to 10 dancers ebeg (men can of all or women of all), a becoming cepet (comedian) with is a real humorous, two people plays Barongan ( depicts animal alike tiger), a chief spiritual or mystique soothsayer assisted by assistant, some gamelan musician and a sinden (singer). Castanets applied usually are consisted of kendang, saron, gong and trumpet. Every stage usually requires time around 3 hour. Show is started usually in the day time. From the time usually is divided to become 3 act, in each act is given time to take a rest player. The players is being this trance does illogical activity. Example of they can eat fraction of glass, wood charcoal, brick without hurting its(the body. There is player having trait like animal that is eating grass, eats coconut, eats paddy with the handle, eats chicken flesh which still raw. Simply action of the player influenced by occult soul or so-called with indang is coming into dancer body. If monkey soul hence action of the player like deportment of monkey. He will go up tree then downwards with under head, opens coconut with bite and breaks with his own head. If entering beast animal soul to eat will eat flesh which still raw. And other occult soul. They do that external from awareness. When player have been tired the leader will heal the players with depress articulation on-hand or foot with reading superstitious formula. One by one player starts is remediable. And all shows had completed. Jaranan juga jadi andalan oragnisasiku lho? soalnya penampilan, olah tubuh dan segala yang nyangkut kesenian yang satu ini, cukup menarik perhatian masyarakat hong kong. di malaysia di panggil kuda kepang ini..